(Nanowerk News) A new technique for counting atoms that overcomes a fundamental limitation on resolution and does not disturb the atoms being measured has been theoretically proposed by researchers at RIKEN ("Diffraction-Unlimited Position Measurement of Ultracold Atoms in an Optical Lattice"). 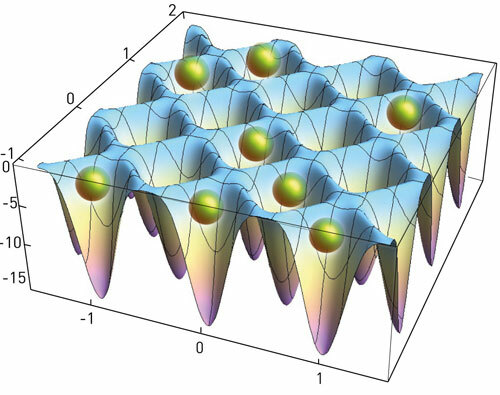 Combining multiple intense laser beams can create a two-dimensional lattice of electric-field peaks and troughs, forming a pattern resembling an egg box (Fig. 1). And like eggs in an egg box, atoms or ions that have been cooled to an effective temperature in the microkelvin regime can become trapped in the minima of this optical lattice. This creates what is known as a quantum gas, which is an ideal test bed for investigating the predictions of quantum theory. The properties of the gas can be controlled by varying the wavelength or the intensity of the laser light, opening the door to generating a wide range of quantum-mechanical states that are not found in naturally occurring materials. For researchers studying quantum gases, it is crucial to be able to determine how many atoms, if any, are trapped at each site in an optical lattice. Conventional imaging methods, such as microscopy, are incapable of imaging objects at the atomic scale, whereas alternative techniques that use intense light to probe each point in the lattice can alter the quantum gas, destroying the atomic state that was to be investigated. Now, Yuto Ashida and Masahito Ueda from the RIKEN Center for Emergent Matter Science and the University of Tokyo have theoretically proposed a non-destructive method for detecting atoms in an optical lattice with single-site resolution. Ashida and Ueda are confident that the same concept can be applied to conventional microscopy and hope to extend their idea to the super-resolution imaging of biological objects.